Tax rates to be moderated. Finance Minister Arun Jaitley has promised a rational tax rate for individuals and bringing down of corporate tax to 25 per cent flat in four years beginning next fiscal, however to remove exemptions excepting of those encourages savings. New York : Finance Minister Arun Jaitley has promised a rational tax rate for individuals and bringing down of corporate tax to 25 per cent flat in four years beginning next fiscal, however to remove exemptions excepting of those encourages savings. 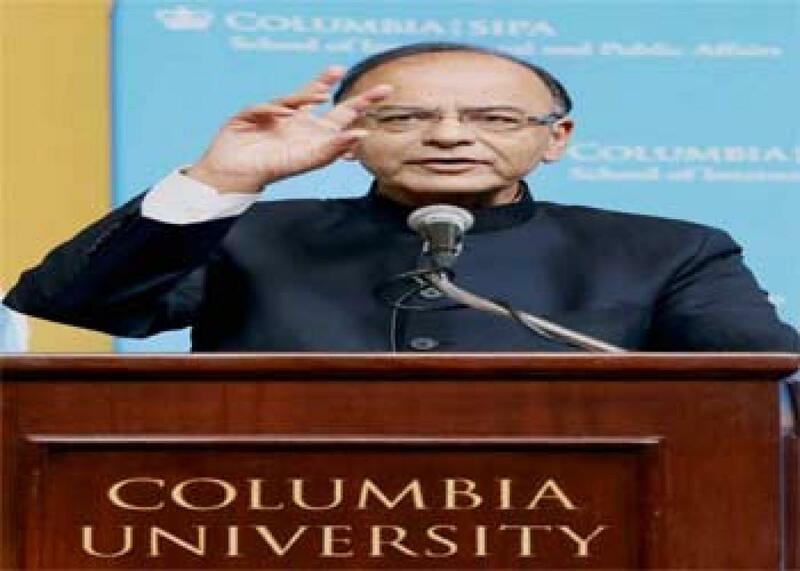 Addressing students and faculty at the Columbia University here, he said along with a rational rate of taxation, more banking transactions and making PAN card compulsory for payments over a threshold limit will go a long way in tackling the problem of domestic black money. He also said that once the corporate taxes go down, the exemptions, over there is a bulk of litigations and discretions will have to be phased out. "As far as corporate taxes are concerned, once corporate tax rates go down the exemptions will have to be phased out," he said and adding that he is looking to put most of the exemptions, except those which encourage individual savings, to an end. Starting with 2016-17 year, the corporate tax rate will be brought down to a 25 per cent flat corporate tax. "Over the next four years this entire rate would come down to 25 per cent. And I will be removing each one of those exemptions one by one. I am shortly going to notify all the exemptions which are going to be rationalised this very year itself," he said. Jaitley said that one of the main problems is of credibility related to taxation issues. "As far as the taxation issues are concerned, a lot needed to be done at our end and therefore in terms of direct taxes, we'd lost credibility with the world," he said. Aggressive taxation did the country no good and does not bring taxes but it "brought us a bad name", he said. He, however, expressed satisfaction that one by one each of those issues related to direct taxes is now being put to rest. Jaitley reassured that the government is "keeping all options open" to resolve the taxation issues either by judicial or executive process. "I think the fears of retroactive taxation... By and large have been put to rest," he said. On growth, he said the revolution of raising expectations in India is a good sign. He reiterated that India has now reached a situation where it is no longer satisfied with a 6 to 8 per cent growth rate and most Indians believe that "my normal is eight plus (growth rate), probably closer to nine per cent" and higher. Noting that India grew by about 7.3 per cent last year, Jaitley said that according to internal estimates, this year "we could do a shade better than that."